ARC Atlantic Arrives St Lucia! 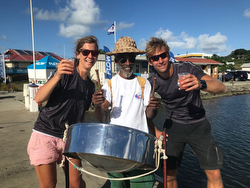 (Rodney Bay Marina, St Lucia)- Three weeks to the day since the ARC fleet slipped their lines in Las Palmas, Gran Canaria, a steel drum serenade is continually echoing around the docks of IGY Rodney Bay Marina. The initial trickle of arrivals has become a constant stream, with the berths, bars, restaurants and marine services steadily filling up as ARC yachts flow in. Friends are reunited, families greet their loved ones, and the Saint Lucia Tourism Authority are keeping the arriving crews in fine fare with a welcome rum punch on the dock and a basket of goodies for them to enjoy. The 2017 edition of the ARC Atlantic attracted nearly 200 boats and 1,200 people to sail 2,700nm across the Atlantic from Gran Canary Island (Spain) to Saint Lucia situated in the Windward Islands of the Caribbean. Those sailing directly from Las Palmas have been playing the weather game, with a split fleet between northern and southern routes during their first week at sea when a low pressure to the west of the Azores, and to the north of the rhumb line, affected the seasonal ENE winds in the central north Atlantic. Most boats later dived south where crews have since been rewarded with some great tradewind sailing. The lone J/crew participating in this year’s event, the J/133 JACKY X owned and skippered by Gerard Feenema from The Netherlands, sailed well in Cruising Division D, a nineteen-boat fleet comprised of mostly 45 to 55 footers. In the end, Feenema’s crew enjoyed their passage and finished 6th boat-for-boat and second on handicap. Like everyone else, after a bit of “R&R” in St Lucia, it will be time to enjoy the rest of the winter season in the Caribbean for this happy Dutch crew! For more World Cruising- ARC Atlantic sailing information Add to Flipboard Magazine. 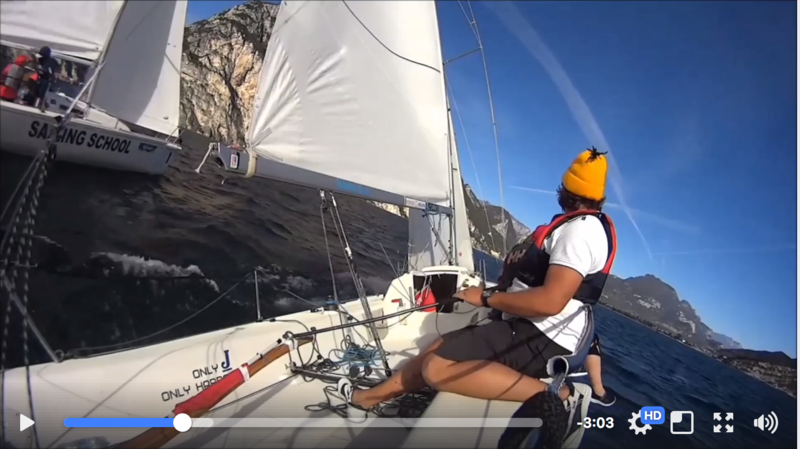 (Fraglia Vela Riva, Lago di Garda, Italy)- Margarita Pchelintseva created a cute sailing video of sailing J/80s on Lake Garda, off Fraglia Vela Riva and racing on their fleet of J/80 one-design sailboats. Enjoy their escapades on this beautiful mountain lake at the base of the Italian Alps in northern Italy....very entertaining! Share with your friends! https://www.facebook.com/margarita.pchelintseva/videos/1413506578697931/ Add to Flipboard Magazine. (Barcelona, Spain)- The third Act of the Real Club Náutico de Barcelona Winter Series for the J/70 and J/80 classes was blessed by good winds, sun, and three races, much to the delight of the sailors and the spectators. The racing took place in a shifty, northerly breeze blowing 10 to 17 kts with occasional gusts over 20+ kts. The offshore breeze made racing difficult to stay at the front of the pack as boats from behind would often over-run the leaders when large, streaky puffs landed on the race area. The highlight for the J/70 class has been the return to racing by the REBUFF team; they had been absent for the first two Acts of the series. Owner David Marco had the great Spanish sailor (2x J/80 World Champion) Rayco Tabares from Las Palmas, Grand Canaria skippering the boat. Their strong performance stopped the runaway train called GUNTER, Javier Scherk’s team that had dominated the series to date. REBUFF won the first race of the day and added two 2nds to dominate the weekend. On the other hand, GUNTER did not even get a podium finish, having to hold on for two 4ths and a 5th to finish 4th place for the weekend. The other two boats that scored a victory for the day were Luis Albert Solana’s PATAKIN, with Spanish Finn National Champion Alejandro Muscat on board, and Massimo Rama’s JENIALE EUROSYSTEM. For the weekend, it was REBUFF first, then PATAKIN second and JENIALE third. For the provisional overall series, GUNTER still leads with 26 pts, followed by PATAKIN with 30 pts and JENIALE with 36 pts. Star J/80 -> BRIBON MOVISTAR! Putting the gas pedal to the floor, and never letting up, was the pugnacious and awesomely fast BRIBON MOVIESTAR sailed by Marc de Antonio. Three bullets for the weekend simply meant they have dramatically extended their lead over the fleet for the provisional overall series. In fact, they’ve won 8 of 15 races so far! The real race, the regatta within the regatta, is for the balance of the podium. The two stars are top women skippers in Spain and it is a real battle to determine who gets the silver and bronze. The two women protagonists are Rosa Artigas’ MIKAKU and Silvia Ravetllat’s AKEWELE. In the first two races, MIKAKU finished right on the transom of BRIBON-MOVISTAR, posting two 2nds. Meanwhile, in the third race, it was Ravetllat’s turn, taking 2nd in that race over MIKAKU. As a result, the two teams are in a virtual “dead heat”, with AKEWLE sitting on 30 pts after 15 races and MIKAKU has 31 pts. The next few weekends should portend the “tale of the tape”. 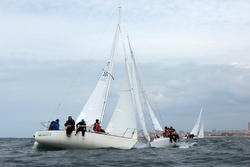 For more Real Club Nautico Barcelona Winter Series sailing information Add to Flipboard Magazine. Jammin’ J/22 Jamaica Celebrates Aloha-style! 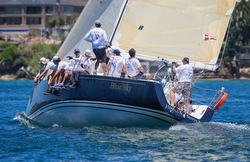 International representation came from CAYMAN ISLANDS again with three teams including defending Champion Bruce Johnson, Suvi with her Vikings and past Commodore Mike Farrington. Representing CANADA was second time competitor Michelle Cimon and from the USA, longtime Montego Bay YC friend Mike Weber. 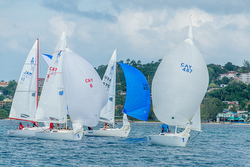 The world-famous Jammin’ J/22 Jamaica Regatta is hosted by the incredibly gracious members of Montego Bay YC. You cannot beat the setting- warm weather, trade winds of 15-20 kts, sunny, and the nicest people you can imagine, sailing on a one-design fleet of J/22s. This year saw the introduction of a chance to improve and learn. Mike Marshall, former J/22 World Champion and North Sails guru, came down to the friendly confines of Mo’Bay and coached for the weekend, enabling some transformations to occur on the race course! Amazing what a little coaching can do!! 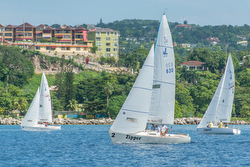 This annual regatta is an open invitation to the global sailing community to bring a crew to Jamaica, race someone else’s boat (with no rental fee), get home hosted (at no cost) and get the ultimate high on a great race track for a very modest entry fee. The perfect regatta for these tough economic times; something to look forward to during the dark winter months of our northern neighbors. 100% of the eleven J/22s in Jamaica made it to the starting line; thanks to owners and racers from Kingston and Montego Bay, and Steven Cooke and PJ Gibson for their help preparing them and transporting them! Day 1- Drifting Long Island Sound Style- What? The imminent arrival of a strong northerly front presented the first challenge to the race committee in setting a course; given that the northeast trades blow all day every day, there is no consideration of any course outside of 060 to 090 degrees. Therefore, 260 degrees was a challenge, with breezes varying from 1 to 5 knots- not exactly the Caribbean-like “blowing dogs off chains” conditions with 18-25+ kt breezes. Great kudo’s to the Race Committee, as four successful races were run including a downwind start in race three (a.k.a. an insanely chaotic starting line). A concerned call from the Montego Bay YC Dockmaster regarding the early, absolutely enormous swell that was sweeping into the bay from the northwest, and well ahead of the front, forced the committee to decide to cancel the day’s racing. With the huge swell breaking on the reefs surround the race course, no wind and heavy rain expected, it was unfortunately for the best- in retrospect, a very wise and prudent move! 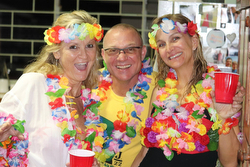 Hawaiian Party- It was a night to remember! Saturday evening has become the famous regatta tradition at Bryan and Lyn’s beautiful house at Great River Private. There is always a “theme party” for it and everyone goes out of their way to dress appropriately for the occasion. This year, it was a funky full-on “Pacific meets the Caribbean session”, with a rocking DJ and awesome decoration. As usual, the bar was flowing and the food was amazing. There was a delicious smorgasbord of food donated by Mo’Bay members and the visitors enjoyed every delicious bite. The highlight of the evening was “Bobbette”, the personal guest of Commodore Nigel, who also featured at prize-giving the next day. For more Jammin J/22 Jamaica Regatta sailing information Add to Flipboard Magazine. More J/Boats Activity in Australia! (Sydney, Australia)- As our friends Down Under continue to learn more about the J/Boats brand, they keep picking up famous lovingly pre-owned racing boats from their far northern sailing friends in Europe and the USA. Recently, Carl Braden, the owner of the J/109 BLUE SKY in Sydney, sent us a nice photo of their team sailing in Sydney Harbour. Carl commented, “we love our J/109! Here is a photo of us doing the ‘Sydney Seven Islands Harbour Race’. We managed to sail well, got on the podium and collected more silverware, something we seem to do a lot with this boat! This time, we came 3rd in Division 1 and were beaten by two well-known all-out racing teams on a Sydney 38 and a Melges 32. We had a ball! Have a great Christmas to the Johnstone clan and J/Boats friends around the world!” Add to Flipboard Magazine. (Tampa, FL)- Fifty-three J/70 teams from the USA, Canada, and the Cayman Islands traveled to Davis Island Yacht Club in Tampa, Florida for the first weekend of the 2017-2018 Quantum J/70 Winter Series. Brisk weather made its way south with the passage of a cold front on Friday night, bringing breeze into the high 20s on Saturday, but backing off some on Sunday. In all, seven races were completed, much to the delight of the very competitive, closely fought fleet. In the end, Brian Keane’s SAVASANA team from Buzzards Bay, MA handily took the victory at 13 net points including two bullets and were the only team in the entire regatta that had all single-digit finishes; in fact, after tossing a 9th place, had all top four finishes as counters! Darby Smith’s AFRICA team from St Petersburg, FL and Marblehead, MA placed second with 35 points after tossing a 38th in race 6. Just two points back was Bruno Pasquinelli’s STAMPEDE from Forth Worth, TX, securing third place with 37 points after tossing out a 5th race DSQ. Rounding out the top five were Peter Cunningham’s POWERPLAY RACING from the Cayman Islands and Oivind Lorentzen’s NINE from New York, finishing 4th and 5th, respectively. There was a strong turnout for the Corinthians Division, with twenty-one of the fifty-three teams participating. Winning by a comfortable margin was Andrew & Mallory Loe’s DIME with 78 pts net. Then, Sarah Renz’s BERTEAU GROUP from Chicago, IL is making a habit of being the bridesmaid, again taking second place (like she did in the J/70 North Americans earlier this year) with a total of 92 pts net. Rounding out the podium was Frank McNamara’s CHINOOK with 109 pts net. Each Friday of the Series, SAIL22 and North U are combining forces for the “Porch Series”. This weekend featured a dock talk discussing boat setup and tuning, followed by on-the-water coaching with North U’s Chuck Allen, Will Welles, and Tim Healy. Practice races were run by J/World, with a debrief immediately after sailing with North U and J/World. 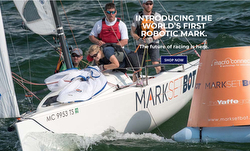 A big “thank you” to regatta sponsor MarkSetBot for providing their innovative “auto-locating” GPS-based robotic mark (learn more here- http://www.marksetbot.com). Racing continues at Davis Island Yacht Club on January 5-7 and February 9-11. 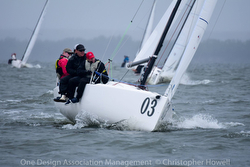 For more Quantum J/70 Winter Series sailing information Add to Flipboard Magazine. (Coconut Grove, FL)- Was it sunny Miami? Lovely Biscayne Bay? The host Shake-A-Leg Miami (who is still working on replacing their Hurricane Irma damaged docks)? Or, the organizer “Twelve USA” (Mark Pincus and Sara Zanobini) that caused the 2018 J/24 Midwinters (March 2nd to 4th, 2018) to sell out (max 40 boats) so quickly? It was almost as fast a “sell-out” as Coral Reef Yacht Club’s 39th Annual Orange Bowl Regatta where the Optis' 300 available slots sold out in 10 minutes. So far, the handicap form is looking good, with many top teams represented from across America, Puerto Rico, Canada, and Mexico. In fact, there are a number of World, North America, and National Champions in the mix. Ironically, the long distance award has to be Mark Laura’s BABA LOUIE from Seattle, WA, the farthest distance away from Miami, FL that you could possibly imagine- 6 hours 45 minutes flying time for some members of the crew, but a 3,302 mile drive in 50 hours for the boat! Joining them will be other top crews like Will Welles’ BOGUS from Newport, RI; Travis Odenbach’s HONEY BADGER from Rochester, NY; Aidan Glackin’s MENTAL FLOSS from Huntington, NY; Mark Pincus’ SCOUT’S HONOR from Miami, FL; Tony Parker’s BANGOR PACKET from Washington, DC; John Mollicone and Tim Healy’s HELLY HANSEN from Newport, RI; and Ken Porter’s MONSTER FISH from Valle de Bravo, Mexico. Four very good women’s teams will also be participating, such as Natalie Harden’s GIGGLES from Austin, TX; Elaine Haher’s A GOOD HAIR DAY from Atlantic Highlands, NJ; Erica Beck Spencer’s SEA BAGS WOMEN’S SAILING TEAM from Portland, ME; and Tonja Holmes-Moon’s SIREN from Denton, TX. Should be fun! For more 2018 J/24 Midwinter Championship sailing information. Add to Flipboard Magazine. 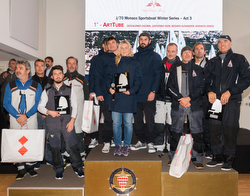 (Monte Carlo, Monaco)- J/70 sailors from nine nationalities were out again in force for Act III of the Monaco Sportsboat Winter Series, organized once a month by the Yacht Club de Monaco from October to March, in collaboration with technical clothing supplier SLAM. It was a particularly testing weekend, with winds alternating between east, west and south, with everything from 3 to 30 knots of breeze! 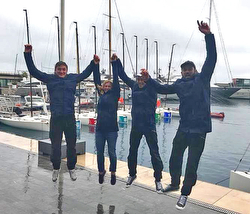 Russia’s top women keelboat skipper, Valerya Kovalenko, guided her team on ARTTUBE to yet another profound win in the third event of the series, a consistency worthy of a metronome. The Russian team has put in a faultless performance since the start of the season. It seems that it is impossible to distract the lady helmsman from Eastern Europe whose strategy seems to get better and better with every race. Kovalenko’s ARTTUBE team posted a 3-1 to dramatically increase their lead for the overall series as well. Nevertheless, for this particular regatta, the Russian ARTTUBE team was feeling the pressure from other teams. Second place was determined by a three-way tie-breaker on 7 pts each between YC Monaco’s Stefano Roberti on PICCININA, Jacques Leveque on the Swiss W.A.T.C.H. and Andi Lachenschmid’s skippering the German ISI-JET. 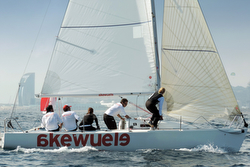 After countback, it was Roberti’s Monagesque crew on PICCININA that won the tie-breaker and securing second place for Act III, while Leveque’s Swiss W.A.T.C.H. team took the bronze on the podium, followed by Lachenschmid’s ISI-JET team from Augsberger Seglerclub in fourth place. Rounding out the top five was another German team, Michael Grau’s PAINT IT BLACK from Norddeutscher Regatta Verein. As a result, the provisional ranking after three Acts show that Kovalenko’s ARTTUBE crew has a commanding lead, with just 18 pts counted. However, the scenario behind her is dramatically different, with a battle brewing between several boats for the remainder of the podium. Currently in 2nd place for the series is Roberti’s PICCININA with 65 pts. But, in the hunt and, in fact, just two points in arrears is Germano Scarpa’s Italian crew on SPORT CUBE! 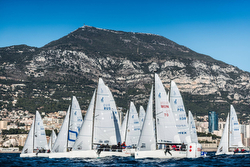 Every year, the YC Monaco’s regatta facilities attract newcomers. For the fifth consecutive year, Monaco has established itself again as a winter training base for many of the major one-design teams come to do battle. For example, the two OMANI Sail J/70 teams that arrived in October for the entire 2017/ 2018 winter sailing season are out practicing every weekend and sailing in every regatta. The final Act of 2017 for the Monaco Sportsboat Winter Series comes to an end on the 19th to 21st of January 2018. Thereafter, the principal opening regatta for the 2018 European sailing season is YC Monaco’s Primo Cup - the Trophée Credit Suisse from 9th to 11th February 2018. 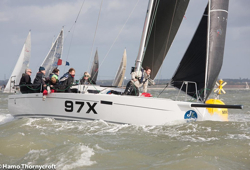 For more YC Monaco J/70 Winter Series sailing information Add to Flipboard Magazine. (Simpson Bay, St Maarten)– In the countdown to the 38th St. Maarten Heineken Regatta, anticipation is building with a number of world-class maxi, multihull and monohull teams having signed up early to race. 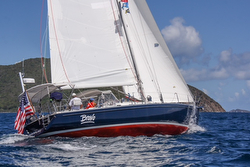 Scheduled for March 1-4, 2018 and staged out of the St. Maarten Yacht Club in Simpson Bay, the regatta is a staple on the Caribbean racing calendar each year, attracting seasoned sailors from around the world with its perfect blend of top-tier racing and lively shore side entertainment. David Pritchard (Atlanta, Ga.), current President of Gill North America and longtime Heineken Regatta competitor and supporter, has raced in St. Martin post-Hurricane Irma and looks forward to returning again in March. The four-day event kicks off on Thursday, March 1, 2018 with the Gill Commodore’s Cup. The optional event is separately scored and followed by an evening prize giving where winners are awarded Gill gear. On Friday, the fleet embarks on the event’s 26 nautical mile Around the Island Race before taking on a series of windward leeward races on Saturday and a single coastal race on Sunday. Each day of racing is rounded out with serious shore-side entertainment, including concerts and parties. 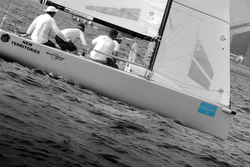 For free concierge service, please contact- regatta@heinekenregatta.com or phone# +1 721 544 2079. 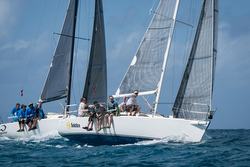 You can register here- http://regattaguru.com/heineken/100237 For more St Maarten Heineken Regatta sailing information Add to Flipboard Magazine. (Hamble, England)- Some twenty-four years since J/Boats with bowsprits first appeared on the Solent scene, they continue to be the predominant brand at local series and the larger regattas. This year’s Hamble Winter Series attracted around 60 J’s, ranging from the J/70 to the J/122e. The standout J of the Winter Series was the J/112E DAVANTI TYRES. The first Grand Prix version of the J/112E for the United Kingdom. She was delivered in the nick of time to enter the famous 60nm Round the Island Race (Isle of Wight), where she won her class. The J/112E Grand Prix has since gone on to win her class at J-Cup, Dartmouth Regatta, and the 2017 Hamble Winter Series, where she was also named “Yacht of the Series” for her outstanding results. It was an extraordinary season for this particular J/112E, as earlier, she was racing as J-LANCE XXII in France where she easily eclipsed her IRC 2 class at SPI Ouest France regatta against all the top factory IRC teams in Europe (JPK, Sunfast, etc.). DAVANTI’s owner Chaz Ivill is absolutely delighted with her; “After six months getting accustomed to how she likes to be sailed, we are now 1/4 knot quicker upwind than we were at Round the Island. We’ve got her pointing higher, which is partly thanks to her floating jib sheet system, and she’s a breeze to keep on her feet. Of the twelve J/Boats that I have owned, the J/112E GP is the best all round performer, quite simply because she’s perfectly balanced and good in any breeze.” Learn more about J/122E here. The J/97E BLACKJACK took the series win in IRC 3 after a hard fought battle with the J/92s Upstart. These two have traded wins in this class for the last few seasons and both boats are past winners of the “Boat of the Series” trophy. Learn more about J/97E here. The unwavering popularity of J/Boats in the U.K. can largely be credited to the vast number of opportunities to compete in high level one-design racing, starting with the J/70. This now legendary sportsboat continues to keep production at both the French and US shipyards busy, with the U.K. class fully immersed in preparations for the 2019 J/70 Worlds that will be held in glorious Torbay. 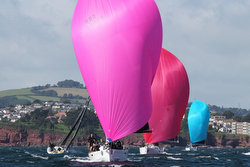 An incredible 170 boats entered this year’s event, so the organizers and locals are excited by the potential spectacle for thousands of viewers in Torbay and around the world. Learn more about the J/70 here. 2018 will be the year the long-awaited J/121 offshore speedster arrives on U.K. shores. This highly anticipated 40 footer is designed to be the best shorthanded J ever, featuring a low drag, efficient hull, a highly engineered carbon rig package, and a water-ballast assist system that adds nearly 400 kilos (4 big guys) of crew weight to the rail. Hull #3 will be raced on the RORC circuit this spring/summer. Learn more about J/121 here. Key Yachting and J/Boats are exhibiting at the London Boat Show and the boot Dusseldorf Boat Show this January 2018. Sailing photo credits- Paul Todd/ Outsideimages.com and Paul Wyeth/ PWPictures.com. Add to Flipboard Magazine. (Boston, MA)- Every boat design strives for something new. But, a new kind of racing? In fact, that's exactly what designer Alan Johnstone and the rest of the folks at J/Boats set out to do with their new J/121 one-design offshore speedster. In the process, they also just happened to create a boat that is both drop-dead gorgeous and sails like a witch—two reasons why it won SAIL magazine's 2018 Best Boats award in the 30 to 40ft Performance category. At the heart of the J/121's design brief was a desire to create a shorthanded speedster that can be competitively raced with just five sailors— as opposed to the eight to 10 normally required to race a 40-footer— in the interest of making things easier logistically for today's busy skipper. Also, on the agenda was a boat that would work well in something called "Open Course" racing: a middle-distance format that combines the best of both around-the-buoys and offshore racing, with an eye toward getting away from the windward-leeward "sausage" courses that have come to dominate one-design sailboat racing in recent years. With this in mind, the J/121 has been spec’d with a "five-sail" rig flying a powerful main, slightly overlapping genoa and a staysail on a continuous-line furler off the boat's deck-stepped, double-spreader Southern Spars carbon-fiber mast. Off the wind, sails #4 and #5 consist of a Code 0 or A-2 spinnaker tacked onto the end of a J/ Boats trademark retracting carbon sprit. The idea is to be able to raise or lower the staysail while either fully deploying or rolling up the genoa to "change gears" depending on the sailing conditions, a la a Volvo 65 or IMOCA Open 60 ocean racer. All lines are led aft, either to the twin helms set immediately aft of a main traveler spanning the breadth of the cockpit sole—exactly as it should be aboard any serious performance boat—or to the cabin top. These include everything from the headsail sheets to the staysail halyard to a 3D genoa lead that employs a series of high-modulus in- and out-haulers and low-friction rings to place the clew of the genoa exactly where you want it. (The boat also comes with a hydraulic backstay adjuster.) The result is a fairly complex network of lines running aft—this is not a boat for newbies. But, it all makes sense and is well within the grasp of any experienced sailor. Then there's the water ballast: yes, water ballast in a J/Boat. Doing away with four or five crew is all well and good, but you still need righting moment if want to carry any kind of sail in a blow, so J/Boats has included a 104gal water ballast tank to either side to take the place of roughly "four big guys" worth of rail meat—rail meat that'll never call in sick or have any kind of family conflicts. The system is simple to use: just prime one of the tanks using an electric pump—you'll know its full when the overflow starts gushing out via a drainage port in the transom—then transfer from one side to the other prior to each tack using a set of valves actuated by a pair of short lines set at the aft end of the starboard-side cockpit bench. Beyond that, the J/121 is vintage J/Boats, with an infused E-glass, balsa-cored hull, a deep low-center-of gravity L-shaped bulb-keel and a powerful high-aspect spade rudder. I really like the sculpted cabin trunks and plumb ends Al has been drawing in recent years, and the look is an especially good one in this latest design. 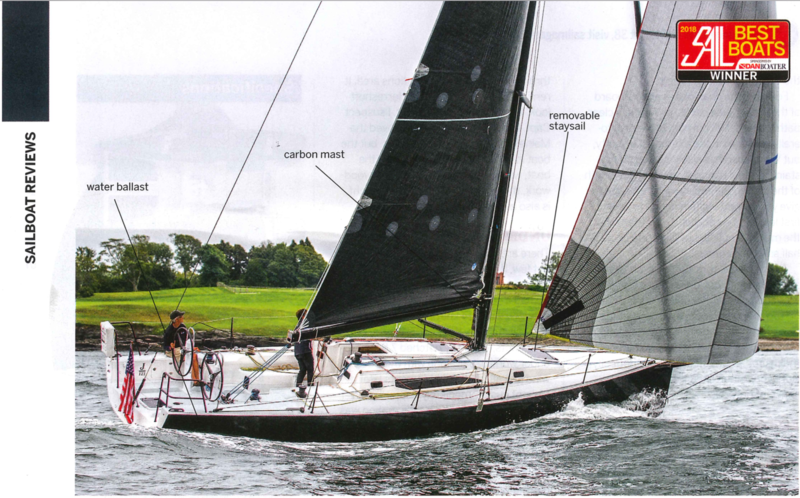 Read the rest of the three page article here from SAIL magazine Read the SAIL magazine 2018 BEST BOATS Review here For more J/121 offshore speedster sailing information Add to Flipboard Magazine. Russian J/70 Sail Training Fun! 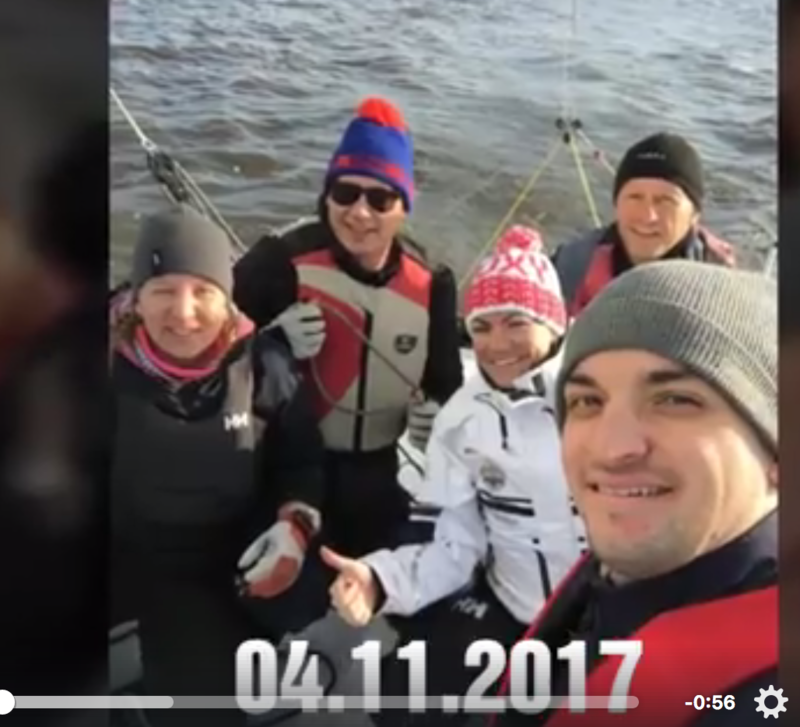 (Kaliningrad, Russia)- J/Boats Russia distributor, Dmitry Zaritskiy from Kaliningrad on the Baltic Sea, sent us a link to a short video based on one of their training sessions this fall. On board J/70 RUS 1272 were Dmitry Zaritsky, Irina Gorbatyuk, Victor Poluichik, Daria Krysina and Sergey Dimitriev. Apparently, it was a great training session for this crew! https://www.facebook.com/dmitry.zaritskiy/videos/10214047276286211/ Add to Flipboard Magazine. 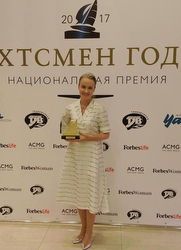 (Moscow, Russia)- At the 2017 Russian Sailor of the Year Awards in Moscow, Russia, Elena Otekina was awarded “Best Sailing Media” due to her amazing coverage of the 2017 J/70 World Championship in Porto Cervo, Sardinia, Italy and also for her coverage of numerous Russian J/70 Sailing League events during the course of the year. “Congratulations” to Elena for her contribution to both growing and bringing awareness of the sport of sailing to the public, not just in Russia, but worldwide. Add to Flipboard Magazine. (Marina di Carrara, Italy)- The 2017 Autumn Championship for the Gulf of Poets J/24 Fleet took place over two weekends and was organized by the Club Nautica Marina di Carrara in collaboration with the Circolo della Vela Marina di Massa. The region is not necessarily famous for its amazing sailing conditions, since the rest of the world knows it for something decorating many upscale households and offices- their renowned “Carrara marble”! The mountainsides gleam white in the day and glow orange at sunset- an astonishing view! In total, ten races were run over the two weekends. A victory in the last race simply confirmed the crushing win the young crew on ITA 304 FIVE FOR FIGHTING put on the dozen-boat fleet. The team was led by owner/skipper Eugenia De Giacomo with crew of Nicola and Matilde Pitanti, Lorenzo Cusimano and Bruna Marco. The sailing was characterized by sun and perfect wind, about 10-15 knots from the northeast on Saturday. Then on Sunday, two more races in similar conditions to count five for the weekend. There were four different winners of the races, including FIVE FOR FIGHTING (race 6 and 10), Riccardo Pacini’s COCCOE, Roberta Banfo’s TALLY-HO (skippered by Luca Macchiarini), and Giuseppe Simonelli’s RAZOR BILL (skippered by Davide Sampiero). At the end of racing on Sunday, F4F had five 1sts and three 2nds in their ten-race tally to win with 16 pts net- a huge margin over the second place team. That boat was Pacini’s COCCOE with 25 pts net. Third and fourth places were determined by a tie-breaker between Pietro Diamanti’s JAMAICA and Macchiarini’s TALLY-HO, with the former getting the benefit of count back to round out the podium. Fifth place went to Simonelli’s RAZOR BILL. "They were beautiful regattas, very fun and very competitive,” commented Pietro Diamanti. "I am satisfied with this edition of the Autumn Championship and the victory of a crew made up of determined and very good youngsters like Five for Fighting, always ready to go down into the water and to commit to the maximum. Congratulations also to Riccardo Pacini, a great return with a super crew formed by my brother Giuseppe, Fabio Apollonio and Renzo Marini and Tommy Fusato." 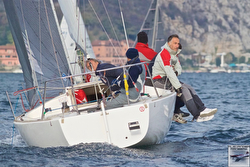 For more Italian J/24 Class sailing information Add to Flipboard Magazine. (English Harbour, Antigua)- “The J/46 BRAVO has done it again,” says proud and happy owner Tom Babbit from Portland, Maine. “We now have three Maine to Caribbean passages under our belts, the first, nearly 30 years ago on our J/40 with 7 and 10 year old daughters as our only crew. As we’ve aged a bit, we have gone longer [46‘) and gradually transitioned crew from family to great and very experienced friends. This year’s voyage was a nonstop (hopefully) from Camden to Antigua. The crew was Galen Todd (J/42 Tango) with whom I have several thousand passage, cruising, and racing miles, and Paul Rogers, (J/42 Canty) who has a transatlantic (on Canty) and ten years or so cruising Scandinavia and the Med - so far) plus a house full of trophies. We delayed our Camden departure to Tuesday, Oct. 31 (Halloween), due to 60-knot winds on Monday in Camden. Our first afternoon and evening were “sporty” going to weather in 25 to 30 TWS with large seas and of course lobster pots to dodge while we had daylight. Things moderated for day two and then we entered the Gulf Stream, with 25 to 30 against the flow. 12 to 14 knots SOG was fun for a while, but the sea state was a bit of a challenge...especially when the tanker Alexia suggested we head up into the mountainous seas and pass astern! A firm negative response from Bravo to that suggestion saw us both agree to alter course hard to starboard and pass port-to-port, nary a mile between us. After that, there was only one more sporty night well south of Bermuda (where we stopped for a few hours to top fuel off). After three days of motoring, the trades filled and we were off on moonlit nights arriving in 10.5 days at first light on 11 November. Except for two shredded jib sheets in the Gulf Stream, zero damage to BRAVO, and a happy landing in Paradise! What a great boat and crew!” Thanks for this contribution from Tom Babbitt. Add to Flipboard Magazine. (Palm Beach, FL)- Nicknamed “the buffet race,” the 61st Annual Wirth M. Munroe Race commenced December 1st for the 60nm course from Miami to Palm Beach. Aside from a short-lived rainstorm, the 22 teams enjoyed sunny conditions with breeze in the teens before arriving to rum drinks and the infamous seafood buffet at the Sailfish Club of Florida. This year’s race was a bit more challenging than last year and that one was tough enough. The boats that did well sailed 11-12 miles offshore, first on a port tack, to go “Gulf Stream hunting”- finding the hot 88 F water flowing at 4.5+ kts north over the bottom! 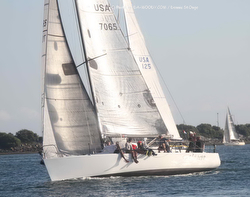 Donald Lasky’s J/30 PAPARAZZI won PHRF B for the 2nd year in a row and was 2nd overall. PAPARAZZI is very well sailed and the crew were really tired when they reached the Sailfish Club- most of the crew are in their 60’s or 70’s! For more Wirth M. Munroe Race sailing information Add to Flipboard Magazine. 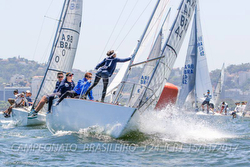 J/70s Sweep SDYC Hot Rum Series Class! (San Diego, CA)- Originated in 1957, the annual Sinnhoffer Hot Rum Series completed its three race schedule (Nov. 4, 18, Dec. 2) under sunny skies and light to moderate winds in San Diego, CA. With a pursuit start and an 11.9 nm random leg course for the 140 teams, the course setup again favored the big boats powering through the fleet of smaller boats that had started in much lighter winds. The J/125s had a rough go of it this year in PHRF 1 class. In the end, they ended up separated by three points, with Viggo Torbensen’s TIMESHAVER edging out Mark Surber’s DERIVATIVE, taking 7th and 8th in class, respectively. Both boats had solid finishes, mostly top ten, but not enough to overcome the big tall rigs of the TP52’s and larger boats. 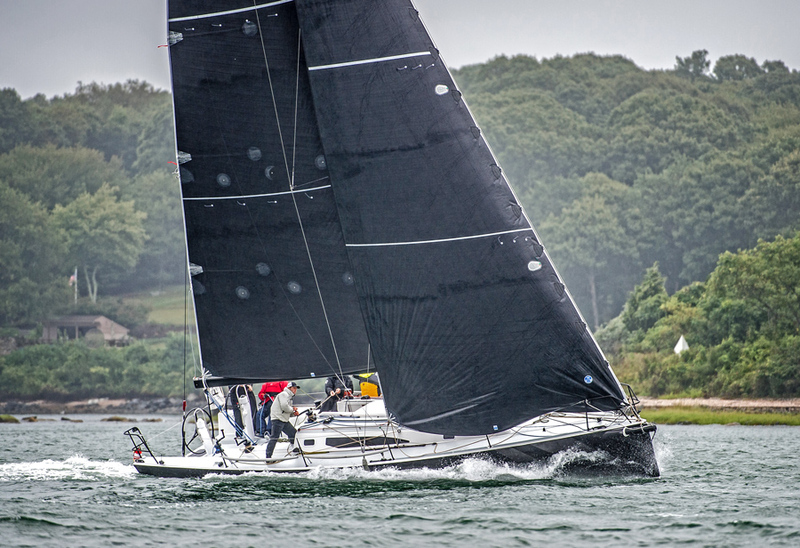 PHRF Class 2 was shaping up to be quite a pitched battle between two J/120s and the famous America’s Cup helmsman- Dennis Conner on his appropriately named MENACE. Going into the last race, the J/120s were 1st and 3rd but could not hold on to those positions. In a light air reaching drag race, the J/120s were a little out-classed. John Laun’s CAPER finished on the podium in 3rd place while his friend Chuck Nichols on CC RIDER settled for 4th place. Usually the domain of the J/105 class, PHRF 3 Class saw a strong performance from Dagfish’s VIGGEN to take home the silver with all top five scores. Then, Scheel’s SUN PUFFIN took 7th, Rick Goebel’s SANITY posted a DNC-2-2 to crush the last two races but was only good enough for the 8th spot. Howell’s fun-loving holiday-trimmed BLINK took 9th and Sanford’s CREATIVE placed 11th. The big winners in PHRF Class 4 were the trio of J/70s. Winning on a tie-breaker at 10 pts each was Fabian Gomez-Ibarra’s VAGAZO, getting the short end of that stick was Wyman’s NUNUHUNU. Then, only one point back was Dave Vieregg’s SOGGY DOLLAR. 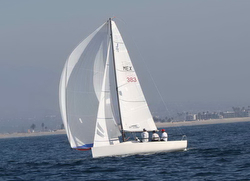 Finally, in PHRF 5 class, The Case’s sailed one of San Diego YC’s J/22s called ZO ZO to 4th place. 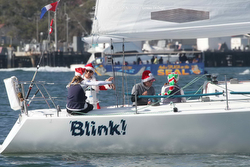 For more San Diego YC Hot Rum Series sailing information Add to Flipboard Magazine. This video, without question, is the very essence of what this sport is all about! Fun, family, perhaps some adult libations (okay, a lot of those), and just getting out there and doing it you’re own way. Watch J/34 IOR KNEE DEEP sailing video compilation here of their 2017 sailing season Add to Flipboard Magazine. J/Sailors Leading Sweep of Volvo Ocean Race? Salon Nautique/ Paris Boat Show - J/112E! 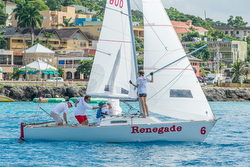 Barbados J/24 Champions- BUNGA BUNGA! Japanese J/70 Crew- Smiling & Having Fun!